"Man made very little progress in travel and knowledge for 6,000 years, but now, near the end of this century, they are increasing exponentially!" Increase of Knowledge and Travel Some 2500 years ago, a young Jewish prophet was taken from his home in Judah by the invading armies of the Babylonian king, Nebuchadnezzar. He was taken back to Babylon where he was chosen to serve in the king's personal service because the king, Nebuchadnezzar, found him to be to an extraordinary young man, full of wisdom, understanding, knowledge, and able to understand all kinds of visions and dreams. The young man's name was Daniel. Nebuchadnezzar did not know it when first choosing Daniel, but he later learned, as the book of Daniel reveals, that Daniel's extraordinary abilities came from the Spirit of God. Daniel was a prophet of Yahweh God. While in Babylon, God revealed to Daniel several major prophecies concerning the future of the Jewish people and of the world. Of the prophecies revealed to Daniel, one that carries great significance in our day is found in the last chapter of Daniel, chapter 12. There it is recorded in verse 4, that in the "end time", travel and knowledge would increase. We are definitely living in the days of the fulfillment of this prophecy! Let's look at some interesting statistics that show this. diesel powered locomotives, airplanes, and even rockets have increased the distance man can travel per year from 1,000 miles to 25,000 miles per person per year. The recent inventions listed above have also increased the speed at which man can travel. By horseback and horsedrawn carriage, the fastest man could travel was about 25 miles per hour or so. And this condition lasted for almost 6,000 years. Then, at the turn of this present century, because of the above listed inventions, man has increased the speed of his travel from 25 miles per hour to 25,000 miles per hour! In the 1800's, Pony Express took nine days to travel from St. Joseph, Missouri to Sacramento, California, about two thirds the distance across the United States. Today, from New York to San Francisco by automobile, the trip takes about 6 days, by rail about 3 days, and by Airplane about 5 hours. In 1519, Ferdinand Magellan set sail in September and completed the first voyage around the world three years later in September, 1522. In 1890, Nellie Bly, an American newspaper reporter, completed a record trip around the world in 72 days 6 hours 11 minutes. In 1924, two U.S. Army Airplanes flew around the earth in 363 hours 7 minutes (15.1 days. In 1933, Wiley Post made the first solo flight around the world in 7 days 18 hours 49 minutes. In 1949, Lucky Lady II, a U.S. Air Force bomber made the first nonstop flight around the world in 94 hours (3.9 days), being refueled in flight four times. In 1962, John Glenn, Jr., a U.S. astronaut, circled the earth in 1 & 1/2 hours. That's 12,000 miles in 1 & 1/2 hours! Since this flight of John Glenn, Jr., we have built even faster, more efficient spacecraft and airplanes, including the Shuttle. I believe we can safely say that travel, both in terms of distance and in speed, have increased as Daniel predicted! satellite television, cordless telephone, cellular telephone, fax machine, VCR's, computers, et cetera. with another from thousands of miles away, simply by dialing a telephone! We even have telephones today that we can communicate with while driving our cars! Incidentally, I have adopted as one of my favorite bumper stickers, "Hang Up And Drive!". Advances are moving extremely fast in computer technology. I have heard it expressed that computer technology is doubling every 15 months. Any one that has recently bought a computer knows this is true because the computers sold as state of the art only a couple of years ago are not so state of the art today. One of the computers in my office, only 4 years old will not run much of the software that is on the market today. Computers and a computer device, known as a bar code scanner have become commonplace at many stores for selling and controlling inventory. They will probably be used in some way in the near future to monitor every person who will receive a "mark" in their right hand or forehead by the order of a man God calls Antichrist. Without this "mark", no one will be able to buy or sell (see Revelation 13). How much more can knowledge and travel increase? Based on the progress we have seen in the last 20 years, what will the next 5 or 7 years be like? Only God knows the answer to this question! The point is that it has been in this century that most of the advances in travel and knowledge have taken place. Man made very little progress in travel and knowledge for 6,000 years, but now, near the end of this century, they are increasing exponentially! As we have pointed out in previous newsletters, for the first time in history many of the "signs" we are to look for that tell us we are in the last days are coming together. Now Daniel's two signs, the increase of knowledge and travel, can be added to that list. They, along with the other "signs" are saying, Jesus is coming soon!Are you ready? Gary Fisher is 44 years old and married to Pam for 16 years. They have one daughter and live in Williamson County, Tennessee. Gary graduated from Franklin High School in 1970. After two years of college at David Lipscomb University, he joined the United States Air Force in 1972. 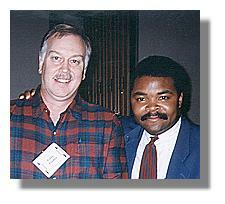 While in the Air Force, Gary read a book written by Hal Lindsey entitled The Late Great Planet Earth. As a result of reading this book, Gary accepted Jesus Christ as his personal Savior and began to study Bible prophecy very seriously. Studying from teachers such as: Hal Lindsey, Tim LeHaye, John Walvoord, Dave Reagan, and many others, caused him to conclude that we are living in the season of the Lord's return. Gary felt the calling to make others aware that like no other time in history, many Bible prophecies were falling into place heralding the return of Jesus Christ. Responding to this calling after twenty years of study, Gary founded Lion of Judah Ministry in January of 1994. Gary serves Lion of Judah Ministry on a full-time basis and has done so since August 1, 1994. Since founding the ministry, he has served as a conference speaker in the World Prophecy Conference in Jerusalem in October 1994 and in the 1995 prophecy tour to Budapest, Vienna, and Warsaw with Lamb & Lion Ministries. Gary has also spoken at other conferences, various churches and Sunday school classes, and was the host and speaker on a daily radio broadcast during 1994 in Nashville, Tn called, Soon And Very Soon. He is a contributing author to Kregel Publishing's theological dictionary to be published in February 1997 and is currently working on two books. Lion of Judah Ministry is an independent, non-denominational ministry that is controlled by a Board of Directors of ten men including four ordained ministers. The Ministry circulates a monthly teaching newsletter and features Gary as an author and conference speaker. The Ministry also hosts a bi-weekly Bible prophecy class in the Franklin, TN area, just south of Nashville, with Gary as the teacher. The focus of this ministry is to call attention to the "signs of the times" that indicate that Jesus Christ will appear very soon. The intent is to make people aware their eternal destiny is at stake and there has been no better time than now to consider where they will spend eternity!